Sonja Alhäuser, Flying Feast, 2012. Catering performance with butter sculptures, marzipan sculptures, various foods, miniature watercolors at the Smart Museum of Art, The University of Chicago. Courtesy of the artist. Sonja Alhäuser, Flying Feast, 2012. Ink and gouache on paper. Commissioned by the Smart Museum of Art, The University of Chicago. Courtesy of the artist. Mella Jaarsma, I Eat You Eat Me, 2002, Photographic documentation of a performance in Yogyakarta, Indonesia. Courtesy of the artist. 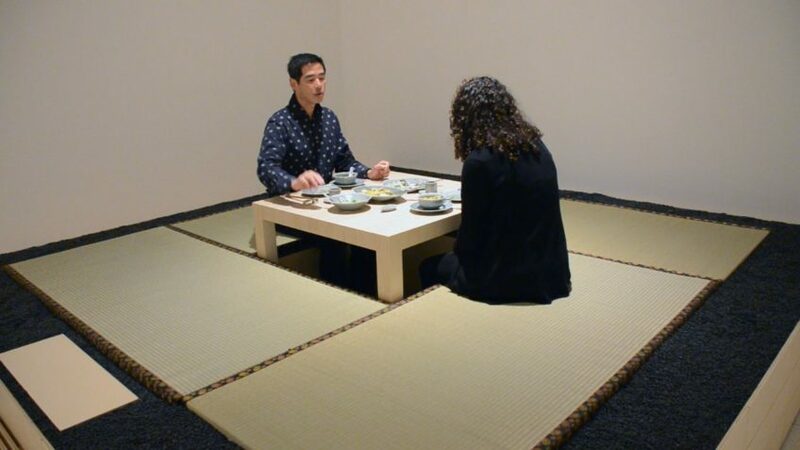 Lee Mingwei, The Dining Project, 1998–2012, documentary photo of performance at the Whitney Museum of Art. Courtesy of the artist and Lombard-Freid Projects. David Robbins, Ice Cream Social, 1993–2008, Participatory artwork; Refrigerator, hand-made bowls, magnets, documentation of events, video excerpt of TV pilot, artists’ book. Courtesy the artist. Since the 1930’s, many artists have used the simple act of sharing food and drink to advance aesthetic goals and to foster critical engagement with the culture of their moment. These artist-orchestrated meals can offer a radical form of hospitality that punctures everyday experience, using the meal as a means to shift perceptions and spark encounters that aren’t always possible in a fast-moving and segmented society. “Feast” surveys this practice for the first time, presenting the work of more than thirty artists and artist groups who have transformed the shared meal into a compelling artistic medium. The exhibition examines the history of the artist-orchestrated meal, assessing its roots in early-twentieth century European avante-garde art, its development over the past decades within Western art, and its current global ubiquity. The exhibition will introduce new artists and contextualize their work in relation to other influential artists, from the Italian Futurists and Gordon Matta-Clark to Marina Abramovic and Rirkrit Tiravanija. “Feast” addresses the radical hospitality embodied by these artists and the social, commercial, and political structures that surround the experience of eating together. (from the SITE winter/spring newsletter).